A representative from WaterCan dropped by last week to recognize our girls for their contribution to WaterCan’s School by School Challenge. Yorkies raised over $7,000 through various fundraising activities such as a walk-a-thon. This contribution went towards clean water for the Bachoo District in Ethiopia. Water is the source of life. Without access to clean water, life cannot begin or be sustained. Once people have access to clean water, sanitation/hygiene can improve, more optimal health can be achieved, and food can be grown. People then can focus on building and strengthening their communities. 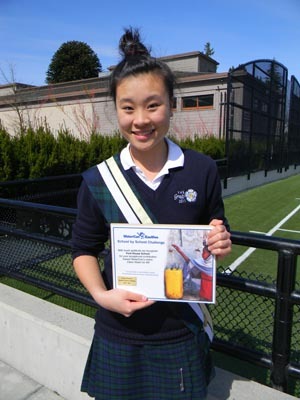 This is why I chose to nominate WaterCan, a local Canadian charity, for my school to sponsor. I support the initiative that WaterCan is taking to develop small scale projects which not only bring aid (water supply, sanitation etc) to communities, but also involve and educate those members of the communities, encouraging and enabling those who WaterCan is helping to also help themselves, thus creating positive long term and sustainable projects. I live in an environment where people (including myself) have a strong sense of entitlement. We feel that we deserve to have all of our basic life needs available for our use. Access to clean water is taken for granted, and quite often, we tend to be wasteful and use an over abundance of water. Through the work of WaterCan, those who are not yet able to feel entitled to clean water can begin to have access to it; and those of us who take for granted the access to clean water are reminded of its importance, and of the unequal access to clean water between the world’s population. Through the work of WaterCan, this will hopefully lead each of us to be more water wise and inspire us to help more people have equal access to clean water. Totally agree with what Abby said. Water is important and we all need clean water if we want to live healthy and strong.